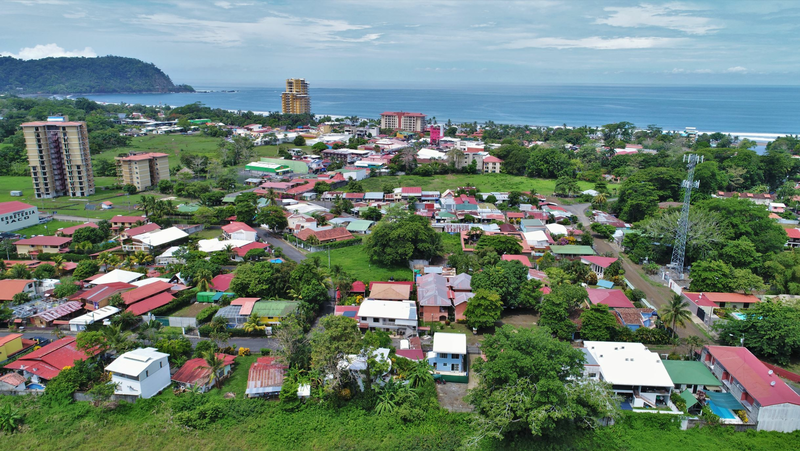 La Paloma Blanca located on the south end of Jaco Beach, Costa Rica, is a gated beach front condominium development. At La Paloma Blanca you have the Pacific Ocean in front of you and the lush tropical mountains as your backdrop. The Paloma Blanca community offers 2 bedroom and 3 bedroom condos. These condos have an open kitchen and living area and luxurious bathrooms. The living room and master bedroom open up to balconies or terraces and from here you can enjoy the view of the ocean or the pool. La Paloma Blanca has three on site swimming pools, two beachfront pools and a large pool located in the central courtyard of the project. This pool has a cascading waterfall, a separate kids pool and an outdoor barbeque and entertainment area. The swimming pools are surrounded with pool decks with lounge chairs. This all gives La Paloma Blanca a serene residential atmosphere. La Paloma Blanca has the folowing amenities; staffed security, parking, elevators, direct access to beach, on site management with rental program. The southern part of Jaco is a bit quieter and more remote but still just outside of the main downtown area of Jaco. La Paloma Blanca is perfect for people seeking remote relaxation. You can walk to town for those with lots of energy or take the short trip by taxi. In the town of Jaco you can find everything you will need. There are several supermarkets and every Friday is the local fruit and vegetable market. There are plenty of restaurants in Jaco as well as many entertainment options. La Paloma Blanca is a great location for those looking to learn to surf. The waves on the south end are smaller and are great for beginners. You will find several local surf instructors for surf lessons out on the beach.